Finest quality, full Northern Bucktails. 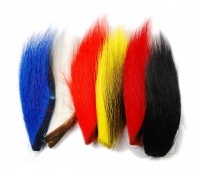 Ideal for tying salmon flies these soft and fine fibres "quiver and shiver" in running water without being moved. Probably the most extensively used material in salmon flies, but also good in some saltwater patterns. A bomb-proof and very robust material for tying those patterns that attract fish.